Businesses these days, particularly those who make their money on the internet, seem to be paying much more attention to their staff and work environment, so that they can really get the most out of them. We’ve compiled a list of 20 of our favourite offices from across the world, to show you what happens behind the scenes of some of the biggest companies on the internet, and some small nuggets of design from more obscure companies. There are offices in this list from some of the biggest companies in the world, but when it comes to making awesome offices, size doesn’t matter. This must be one of the most relaxing offices to work in, because you’re half underground, and half above ground, with views out into the woods. 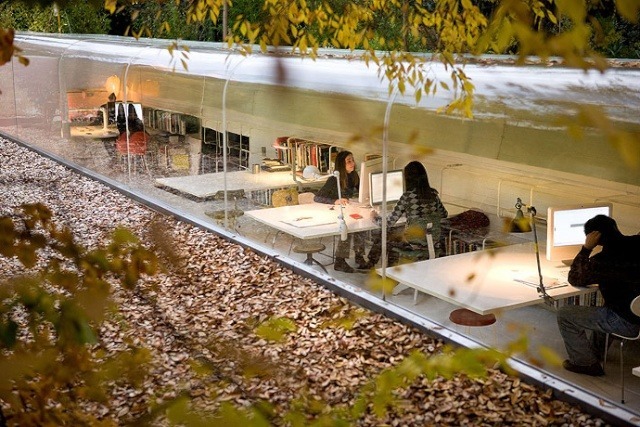 This is Selgas Cano Office, which was designed by Iwan Baan and is situated in a forest, near Madrid, in Spain. This office for architects is light and airy, with clean lines and colorful details, making it a great place to work from. It’s less about awesome fun slides, great food and gaming areas, and more about a relaxed environment, away from harsh lighting and big empty rooms. It’s no secret that Google is a fun, fresh company, with tonnes of money, and dedicated employees, and part of the secret behind these employees is the awesome offices that they work from. 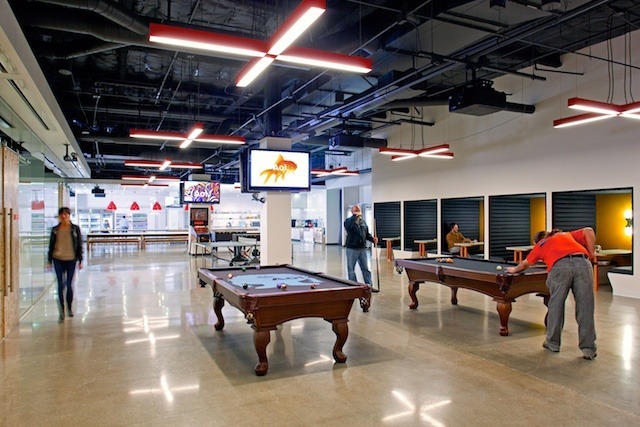 Google put a lot of time and money into making the perfect work environment, mixing business with pleasure so that the staff can relax and refuel during their breaks. 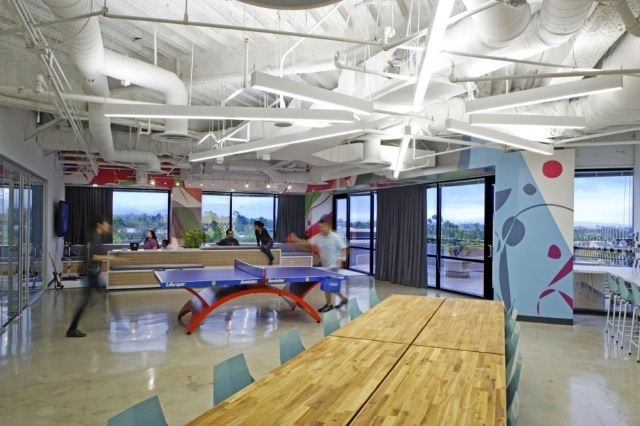 Google thrives of creativity and that thought has very much gone into the reasoning behind the designs of their offices, providing every employee with a space for them to be creative. There’s a rule at Google that nobody is allowed to be more than 100 meters away from food, so you’ll find kitchens everywhere, as well as an awesome cafeteria where every employee is fed three times a day, for free. 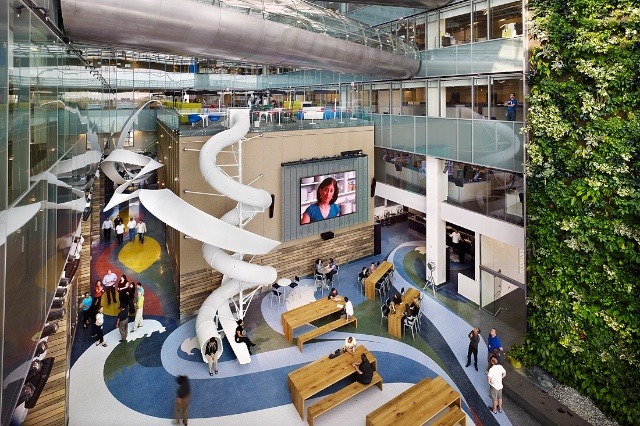 If you think that the offices are over the top and far too big, then at least you won’t have to spend all your time walking everywhere as you can just take the slide or fireman’s pole around the building. If all of that’s not enough for you, and you really want somewhere quiet to relax and get away from work, there’s always the library or aquarium. Situated in a build of great character, we have the London office of Red Bull, which is a converted building of five old pubs in Soho. With none of the buildings originally linking together, or even having floors on the same height, this was always going to be an interesting building with plenty of space and cool features. Red Bull isn’t just about energy drinks, these offices are for roughly 100 people in their 20’s mostly, to come and collaborate and be creative together in these unique spaces. They threw away the corporate office rule book and decided upon a more lounge like feel, with original features from the old buildings, and a reception that turns into a bar at night. This is the perfect workspace for the young Londoner looking to be creative with one of the most interesting companies around. It’s no secret that AOL isn’t the company that is used to be, but they’re trying to make big changes with the purchase of websites such as Techcrunch and Huffington Post, and they’ve recently had a massive overhaul of their headquarters to suit. They’ve gotten rid of the bland corporate facade and taken a leaf out of Google’s books and tried to make their office more fun and inspiring, with fresh new designs. 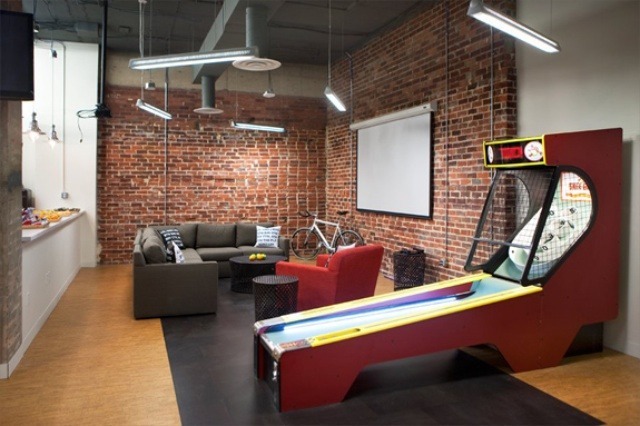 This office is everything you’ll come to expect from enormous internet companies with large kitchens, splashes of color, countless relaxation areas, pool tables, games rooms, and of course, the all important work spaces. This is a company that knows the importance of a happy and comfortable work environment, but have given it a slightly different twist to some of the companies on this list. The design of this office involves a lot of reclaimed or recycled materials such as old street signs, a salvaged pizza oven and a wood from a barn and a church. But just because they’ve used old materials, doesn’t mean the design has to suffer as the attention to detail and finish is superb, and the mix of raw materials really help it to stand out. To top it all off, the office is finished with a bearskin rug, which is rather suiting I think. Designed by the same people that did AOL and Facebook, the Dreamhost office is another one of those office with bright open spaces, which have gotten rid of personal cubicals to encourage interaction between the staff. Open and private areas are scattered about the building for meetings, relaxation and work, as well as games areas and places to eat. Designs like these may start to appear quite common, but I assure you, this sort of thing only happens when big bucks are involved, how many of you have played ping pong at work? Large glass windows make for a light work environment, away from harsh fluorescent lighting, while the variety of flooring and splashes of color make it feel a lot less clinical. This has got to be one of the coolest buildings to build an office in, which came about when alternative clothing company Comvert were looking for a new space for their headquarters. During the search, they happened upon an old abandoned cinema that seemed to offer the perfect solution. It was big enough to house all of their offices, warehousing and even room a shop in the front, however, there was one ‘problem’, what would they do with all the extra room above where the audience sat during a movie? The answer is unique, inspired, and all but simple – build an indoor skate bowl which sat suspended above the warehouse. This was a perfect solution for all the space, while keeping the staff entertained, and fitting in their alternative clothing brand image. 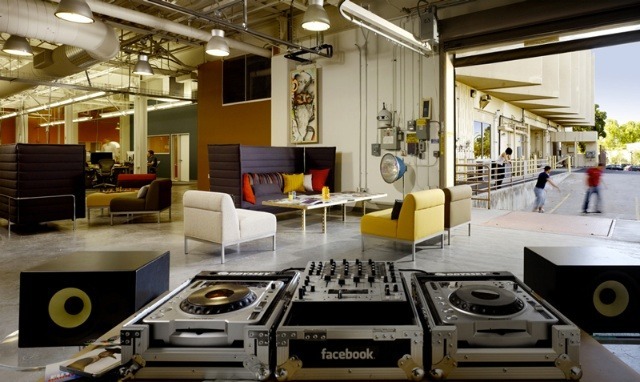 Facebook went around their office design a little differently to most companies, actually using it’s own software to conduct polls asking their employees what they would want from an office. The result was a superb work environment with big open spaces to work from, and amazing relaxation areas with a place to skate and DJ from. That’s right, there’s no simply plugging in your iPod to a dock, there’s a whole booth that you can polish up your mixing skills at while entertaining colleagues. All of this combined with the modern, comfortable styling of the complex and means that Facebook is one of the best places to work and play, which is ideal really, considering their employees look after 500 million people a day, from roughly 750 million active accounts. YouTube is an interesting company really because it was sold in less than 2 years for princely sum of $1.65 billion, yet it’s earning capabilities seem to be far below that. That hasn’t stopped Google from splashing out on big expensive offices though, which seems to be a trademark for them. 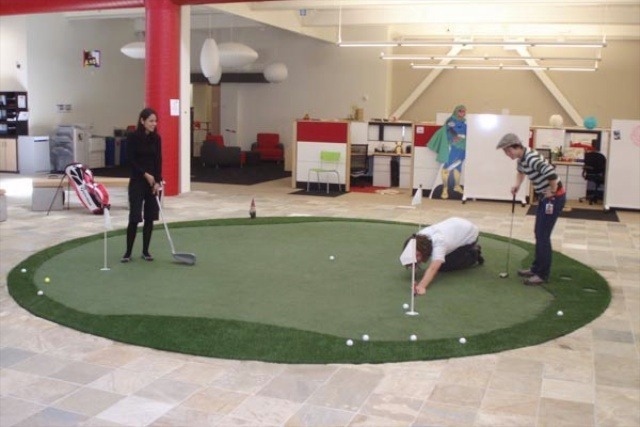 Big open floor plans and perks for employees dominate this office complex, as they can relax with a bit of indoor putting, free-roam Segway riding, eating, gaming, swimming, and gym activities, to name just a few. It’s business and pleasure all rolled into one at YouTube, with the hopes that the staff will be relaxed and inspired enough to come up with new ideas and work well with their colleagues. Dtac recently decided to put an end to separate office spaces throughout the city of Bangkok, and brought all six buildings under one roof, which happens to be the largest ever office lease in Thailand’s history, occupying around 650,000 square feet. The move and design reflects the company’s desire to become the employer of choice, to “enhance cooperation and communication, strengthen common goals, increase creativity” and make it easier for the brand to react quickly to changing conditions. Dtac’s brand approach is “play and learn” and they wanted to reflect this to their employees and customers with their new, rather inspiring office, spanning 22 floors. Some of the highlights include a massive circular library amphitheatre, and an entire floor dedicated to fun, with indoor soccer, table tennis, running track, and concert and performance spaces. To feed creativity, there’s the Conversation Pit, the Freeform Meeting, Picnic Table and Dining Room, all created to encourage informal, face-to-face meetings. And lets not forget what tops off the building – an open terrace overlooking Bangkok’s skyline. 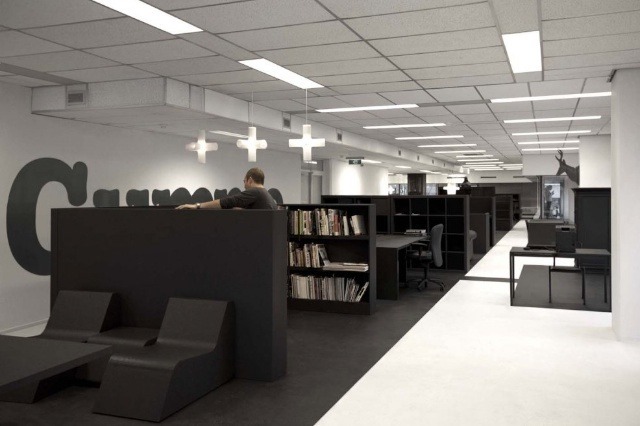 As Gummo were only going to be renting the space on the first floor of the old Parool newspaper building in Amsterdam for two years, i29 convinced Gummo to embrace the mantra of ‘reduce, reuse, recycle’ to create a stylish office space that would impact as little as possible on the environment and their wallets. Everything in the office conforms to the new house style of white and grey. All the furniture was locally sourced from eBay, charity shops and whatever was left over at the old office. Everything was then spray painted with an environmentally friendly paint to conform with the new colour scheme. The new office is a perfect case of a smart way to fill a temporary space stylishly and at minimal cost. If you’re anything like me, then your ideal office is anywhere that you can be surrounded by Lego all day, and that’s what it’s like working at Lego. The colourful open-plan layout encourages interaction and play between the staff, in an effort to fuel their imagination, which is what Lego is all about. The meeting rooms are all light, colourful, and open, and vary in size depending on their uses, but they’re all designed to one thing: provide a happy and comfortable working environment to boost moral and product development. The whole office is designed so that anyone can play with the lego and come up with something new, while getting work done, and enjoying their time at the company. If spending the whole day playing and working with Lego doesn’t make you happy, then I don’t know what will! If you’re not from America, then you may not have heard of Zappos, but they’re a huge company, in fact, they’re the world’s largest online shoe retailer. Customer satisfaction is the secret behind their success, and that’s what they’re famed for, which is why it’s part of one of the most successful sites on the internet, their new owners – Amazon.com. This culture of realising people’s importance and individuality has been transferred into the Company’s headquarters where each employee gets their own little imprint into the office design. 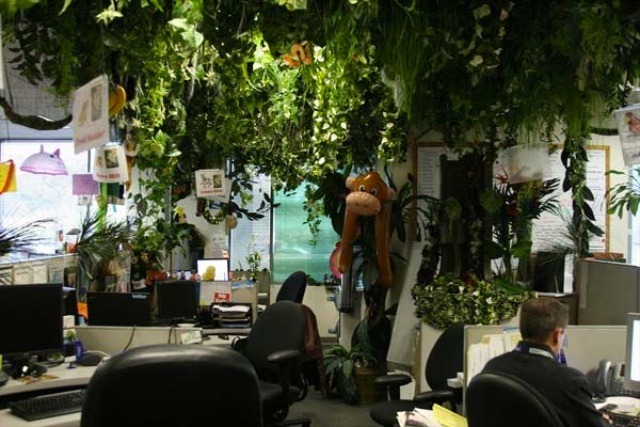 Unlike most of the companies on this list, Zappos have stuck largely to cubicle based design, only they encourage each and every employee to make them their own, with decorations, toys and trinkets. This means that every cubicle is unique and the office feels less sterile and more enjoyable to work in, the staff even get a say in the design of the conference rooms. If you happen to be in Las Vegas, you can take a short trip out of town and actually tour the office and learn all about Zappos for free. This unique office and conference building is made up of three wings, which are separated by the sliding walls, and can be opened up to create a single, colourful meeting room. The design of the office isn’t what you’d call typical, even by the standards on this list. There’s a library/conference room with wooden swivel chairs, bizarrely shaped rooms with slanted ceilings and chalkboard walls, miniature staircases to take you to green carpet-clad phone booths for conference calls, all inside what can be best described as a white warehouse. 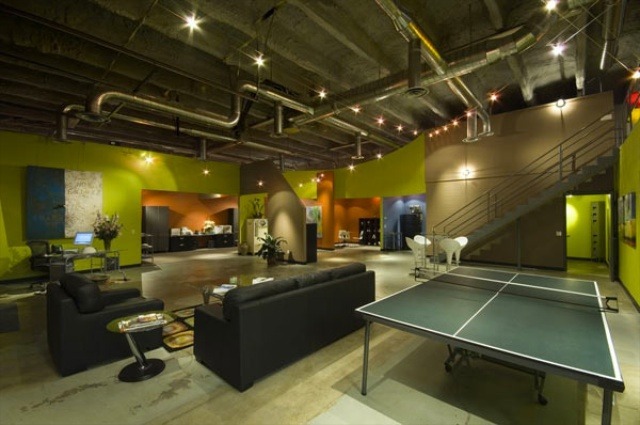 This is the office of an advertising firm in San Francisco, and their unique offices are designed to stimulate the creative juices of those working inside them. And when it’s time to take a break, there’s always the indoor garden, or the huge and colourful dining room, where the staff can relax and carry on socialising. 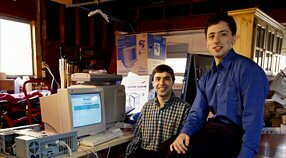 It’s amazing to see just how quickly technology companies can grow these days. Big In Japan is a Dallas based mobile app developer started in just 2008 with their award winning, barcode scanning app; ShopSavvy. They’re now in an ever-expanding and modern office which focuses on open plan working and cool decorations, such as the nine foot Hulk statue. Like most of the offices on this list, BIJ have done away with work cubicles and opted for a more clean finish, with a glass-walled conference room to give the impression of space. For relaxation, there’s always Rock Band and various games consoles, with comfy leather sofas and been bag chairs to enjoy the multiple TV’s from. The mix of work and play is everywhere in this office, with Fussball being only a chair swivel away from work, Big In Japan understand that to be able to make things fun, you’ve got to be able to have fun. They’re still a relatively small company for now, but it’s clear that that they’ve taken a leaf out of the books of the big boys, and made their office all about the employees. 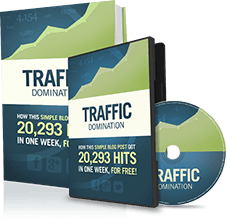 Traction Marketing Group started off with just a plain warehouse and got creative with it. With colour splashed over each wall, there’s an interesting mix of blue, green, brown and grey scattered across the large and open-plan office. They’ve done away with the harsh florescent lighting, and opted instead of spot lighting and festoon lighting that swings down across the ping-pong table. The smooth concrete floor is host to multiple seating areas where employees can go to rest, and the massive glass garage sized door floods the entire office with natural light, making for a much more comfortable work environment. It quite clearly used to be a warehouse, but that adds to the character and prevents the feeling of a sterile workspace. The whole building is designed to reflect the company’s style of business and they can tell from experience that by having the same approach with where they work, yields better results. If you’re not familiar with LivingSocial, they’re a daily deals company, in the same vain of Groupon, and much like Groupon, they’re growing rapidly. To house this new workforce, they need a big, new, comfortable workspace to put them in, which reflects the company vision and encourages staff interaction and collaboration. There’s a stark mix of old and new in this building as some parts of the ceilings and walls are left bare to reveal the past, which contrasts with the company’s new modern design for the office. Exposed brick, antique doors, and old shutters can be seen in the same room as a large mirrored wall, games machine, flat screen TVs, and photos of doughnuts. With a company this young, they rely on a lot of hard work, but to make sure that the staff aren’t overworked, there’s a mix of work hard, play hard to make work not even seem like work. I work from my computer, indoors, at least 50 hours a week, and the one thing that I don’t have in my office is enough nature. ThinkGarden understand that to do work, we have to spend most of our time indoors, but there’s no reason why we can’t being some living nature in with us. Their whole office is designed to reflect nature with stone shaped bean bags, large plants, flowers and trees, and unusual desk positioning. Even the walls are designed to make it look like you’re in the middle of a woods, and the bright white furniture contrasts with the plant life, making it stand out even more. If you don’t think this office is green enough yet, then maybe the putting green in the reception area will change your mind. This office differs to all the others on the list for one reason, and that’s the budget. It was limited to just $40 per square foot, which forced the designers to think outside the box, but well, it seems they didn’t get much further than just the box. You see, because this had to be done on such a tight budget, they took to customising a bunch of shipping containers and turning them into office space inside a large warehouse. This unique design and fresh colours make for a rather interesting work environment, that’s not just cheap to build, but cheap to run. Pallotta TeamWorks is a charitable organisation which specialises in raising money for different needs, through putting together fundraisers for people to take part in, and raises tens of millions of dollars each year for charity. This is one of the largest offices on the list, and by the looks of things, one of the most fun. It’s a massive 500,000 square feet, and home to Corus Entertainment. It’s been labeled Toronto’s smartest building. The building brings together 1100 staff which used to be housed in 11 separate buildings, into an open office environment with multiple social spaces, even including a five story atrium with a three story slide and lounge above a couple tv studios. This building is all about having fun and bringing the entire work force of a company together in one place to create a boost in productivity, helping the company to continue to grow. 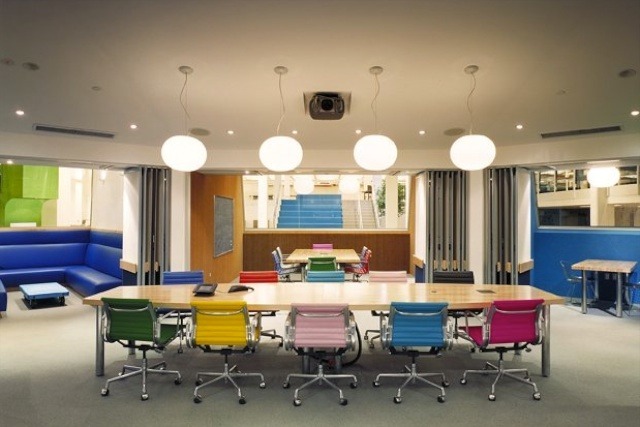 Bright colours, big TV’s, boardroom tables shaped like ice hockey rinks – this building really has it all. I like the black and white design of Gummo, but can’t deny the appeal of a skeeball machine at LivingSocial!! A great post that is about design, a topic no many are really interested but it was the cause of the tremendous success of Steve Jobs, I like the office of google, congratulations because it is a really refreshing article. I’d have to go with Dtac as my favorite from this list. However, having a massive slide down to abottom floor wouldn;t be bad either! 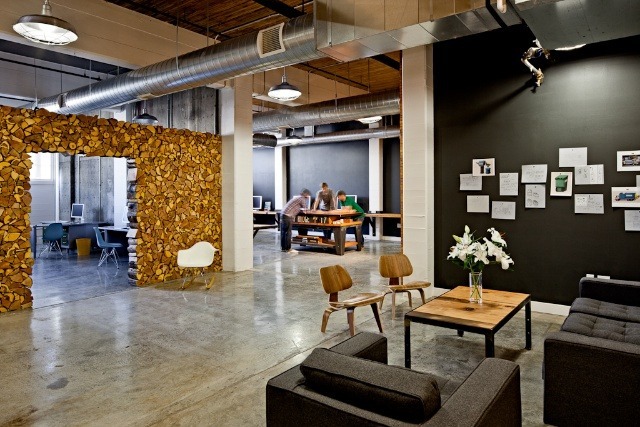 I love the look of these offices and the emphasis on little to no paper and ergonomics. 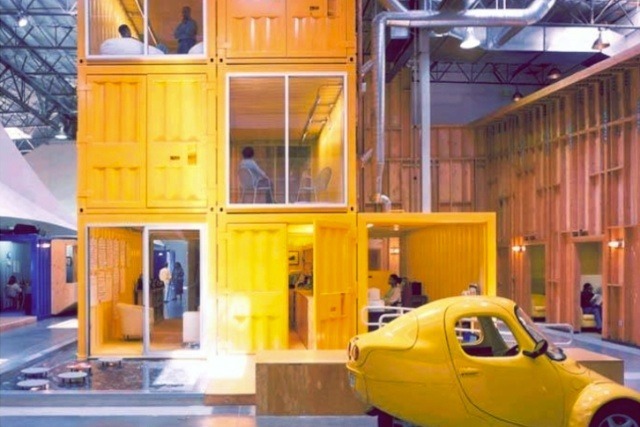 Being from the construction industry, our offices look nothing like these unfortunately! Nice post. Could you show us YOUR office ? Totally agree. What does your office look like? It currently looks like a complete mess because I’ve just moved house, but It’s very comfortable. Selgas Cano, AOL Headquarters and Google Office are the ones I’d really go with. Come to think of it, they really have cool designs but it doesn’t mean the others are not cool though. Selgas Cano deserves its position as first btw. You’re doing a great job, Josh. Wow! Corus Quay looks like a large shopping mall. That’s one cool concept that I’m sure creates a very motivating work environment for their employees. Those are some crazy cool company offices. I wish I had an office like that to work in. I guess working in the Caribbean isn’t that bad though. haha. As far as I can realize, you have been paying attention to all “little” things that might turn any starting business into a large one. It’s hard to say where you’ll be 1, 5 or 10 years from now in this industry, but, right now, I can say congratulations for your work! Corus Quay+ Selgas Dano= the perfect office space…. My near-future office is going to resemble one of the above! Always have loved Legos. Love that they encourage the use of their product at the office! This is the way people should work. 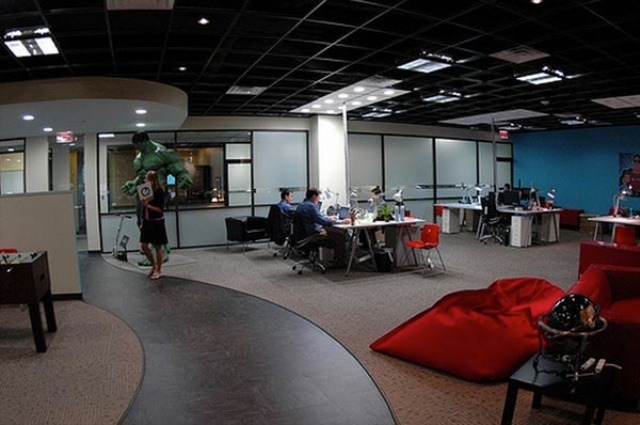 An environment that allows people to “feel at home” which stimulates creativity. I love the one with the slide and would use it everyday and I’m 57 and I don’t deny my inner child. I play football with a guy who works at Red Bull, no wonder he comes in to the dressing room with a huge grin on his face every Saturday, I would working in an office like that! Excellent share and amazing working places indeed. Here in Sydney, we desperately need one of those slides down from the mezzanine level. I’m guessing cost a fortune. It’s such a good, inspirational post, thanks a million. 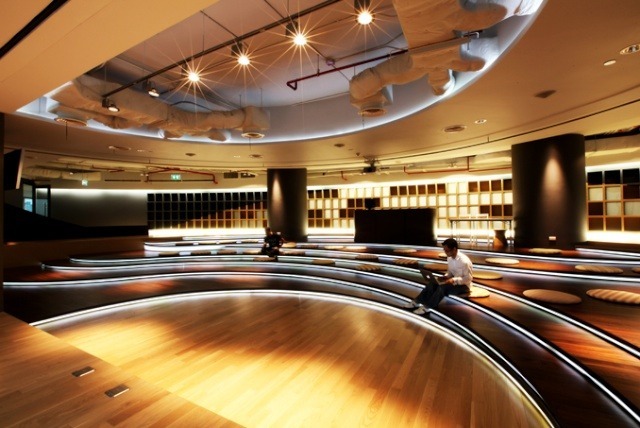 These office spaces are awesome! At launchleads.com, a 3 yr old startup, we can’t even dream of having anything this extravagant, but that’s ok because we were thrilled with the new orange chairs we got last month! Ah, the simple joys of a startup. One day we’ll make this list. This is awesome Josh. Simply awesome! The time spent on the research is quite evident. As a big fan of aesthetic designs, I’m definitely saving this. Damn!! this is called luxury… Really makes great sense! i hope my new office gets better than 1 of these…. pray for me please? Great article! 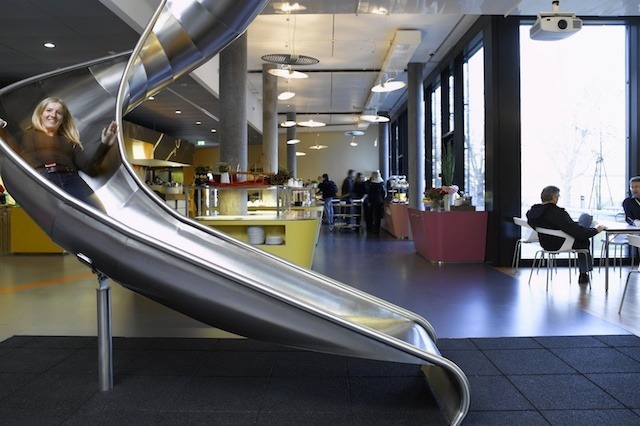 I would love to have an office with a slide….how fun! My office is most like ThinkGarden in Milan., very sunny, white and natural woods…….but I guess I need a few more plants! Great compilation Josh! Hoping that someday I can work in a fantastic and cool office like that. That’s what employees need, an office that feels like home. Having an excellent workplace can really help boost employees motivation towards work. Those offices look amazing. It’s amazing how your environment can completely change your productivity!